I didn't intentionally skip October's Goals, I just never got around to the post, but it's like the universe knew I wouldn't have time to do any as it was. It was a whirlwind of a month and I didn't even have time to blink, if I'm honest, but hopefully things (fingers crossed) are slowing down and I can actually do some planning. 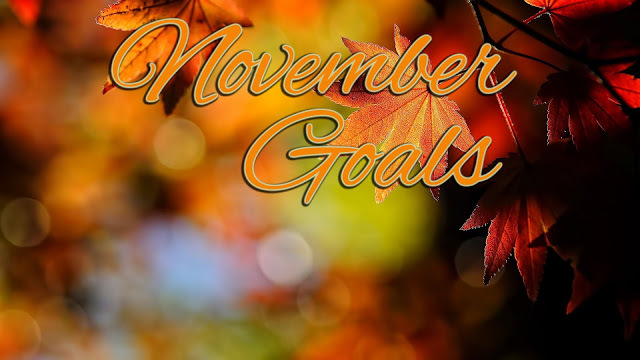 My November goals aren't unlike last years and they, of course, involve the upcoming holidays, but last year was pretty successful so maybe I can have a similar outcome this year. - First goal is to start Christmas shopping. I was slightly farther along last year but I definitely feel like I have a better general idea this year of what I want to get people and with me and the hubs foregoing gifts for spending some time together this year I don't feel as much shopping strain. - Second goal is to maintain a healthy schedule. I struggle with this all the time, but especially come holiday season. I find I have a hard time sticking to a routine this time of year as I'm constantly making excuses to blow my diet or stay up late and I'm going to make more of a conscious effort to avoid that. Not entirely, mind you, but more often then not. - Third goal is, as the weather has turned quite cold lately, to spend my time indoors doing some major organizing. Since the move, all my stuff is kind of helter skelter and I'd like to take the time to go through everything and start deciding what to give to charities, throw away, etc. I hope to really pare down what I have by half before the end of the year. Super perfect goals for the holiday season! I was slightly further along at this time last year too with my shopping. I have ideas I just have to get them, LOL! I hope you have a wonderful start to your week sweet beautiful friend! Good luck with your Christmas shopping! Great goals lovely lady! Great list of goals! I'm still working on de-cluttering our home too. Just a couple of days ago I donated 3 bags of clothing to salvation army and it felt so good to get rid of it. Good list girlfriend! Chuck and I are not getting each other anything either, we're just thankful for us to be together and healthy. I think we may do a fancy dinner out to spoil ourselves that way :) I feel more behind in shopping this year too and it's stressing me out, but I'm sure it will get done someway! Hope you're having a great week! It's definitely hard to stick to healthy routines in winter but if you focus enough you can ! I'm going to have a goal this month to get my girlfriend birthday presents ( It's only a few days after Christmas ) and I want to really get into yoga ! I really need to start my christmas shopping soon too! Girl, I wish we haven't had all those cakes, cookies and what not in our cupboard. My hubby is a believer in desserts every day lol. I just need to get my willpower together!! !